This is part 3 of a multi-part tutorial on setting up vocoder plugins in Cubase. See part 1 if you missed the introduction. XILS V+ is modeled after the classic Roland VP-330 Vocoder Plus, which sported both string and voice synthesis capabilities in addition to a vocoder. V+ is available in VST 3 format, making it easier to configure than most other vocoder plugins, however the plugin itself is quite complex. You will need to devote some focused time to studying the user guide and experimenting with this plugin to get the most out of it, but this tutorial will at least help you get the vocoder section working in Cubase. We're going to take a look at two different configurations: One using V+'s built-in synth engine as the carrier, and another using an external carrier. In this configuration we'll use V+'s built-in synthesizer as the carrier. This means we need an audio track or group channel to serve as the modulator (voice), and a MIDI track to play the carrier signal on the plugin's synth. 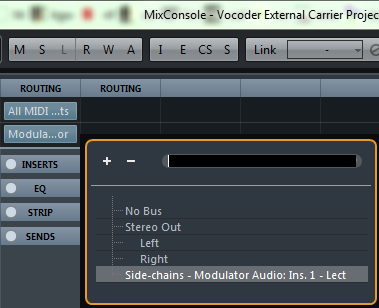 The Vocoder Internal Carrier demo project in the tutorial projects download is already set up for this. 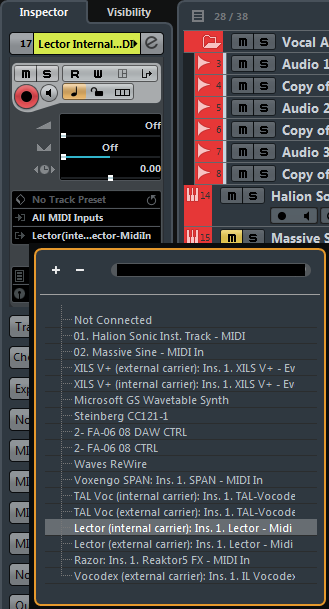 If you have both the VST 2 and VST 3 versions installed, both will probably appear in the plugin selector, because unlike Waldorf Lector, XILS internally uses different plugin IDs for the two flavors of V+. (The VST 3 version has an "III" icon in its entry in the plugin list.) While VST 3 is not really required for this configuration, it's usually best to use VST 3 when available. Since V+ isn't just a vocoder, not all of its presets use the vocoder feature. 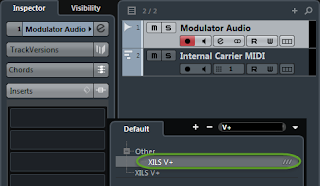 Choose the Factory > XILS-lab > VOC Reverb Vocoder XO preset to begin with. Begin playback on a section of your project that loops your modulator and carrier tracks. You should now hear a vocoded harmony line. There isn't a whole lot of visual feedback in V+. The green LED will illuminate when the plugin receives a modulator signal, and the red LED comes on if the modulator is nearing maximum volume (though it doesn't necessarily mean that it's clipping). Lower the volume on your modulator track if you hear clipping or distortion. The keys on V+'s virtual keyboard will indicate when the plugin is receiving MIDI. 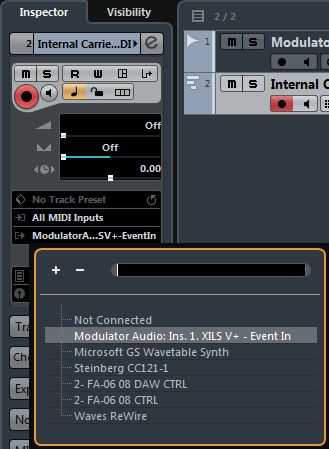 If you don't hear anything or see key movement, check your MIDI routing. Also make sure the EXT SYNTH fader next to the Master Volume knob is all the way down. In this configuration, we'll pass audio signals for both modulator and carrier. 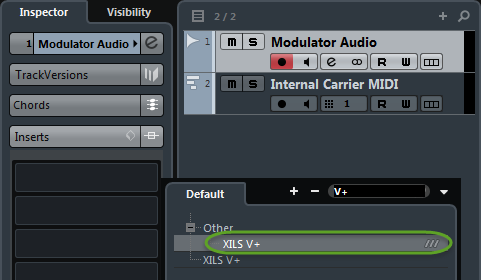 The Vocoder External Carrier demo project includes an audio clip to use for the carrier, but the carrier could be a VST instrument as well if you have programmed MIDI that matches your audio material. Click the Activate Side-Chain button so that it lights up in orange. If you're using an audio track or group channel as your carrier signal, select that track in Cubase. In the track's inspector, route its output to V+'s sidechain input. 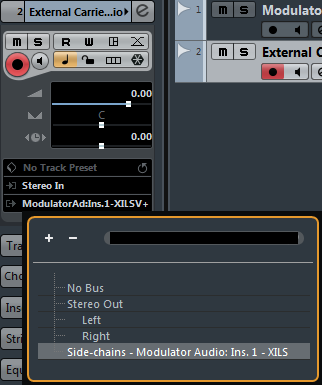 Otherwise, if you are using a VST plugin as your carrier, open the MixConsole, and on the channel strip where your plugin resides, change the output routing to V+'s sidechain input. 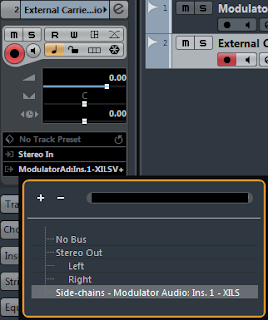 Route VST plugin outputs from the MixConsole window. Above picture is from the Lector post. You will see "XILS" here instead. 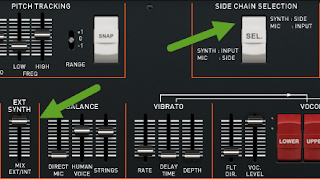 In V+, put the EXT SYNTH fader all the way up and make sure the SIDE CHAIN SELECTION rocker is in the up ("Synth: Side, Mic: Input") position. 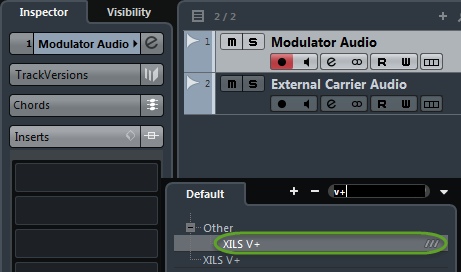 Begin playback on a section of your project that loops your modulator and carrier tracks. The green LED will illuminate when the plugin receives a modulator signal, and the red LED comes on if the modulator is nearing maximum volume (though it doesn't necessarily mean that it's clipping). 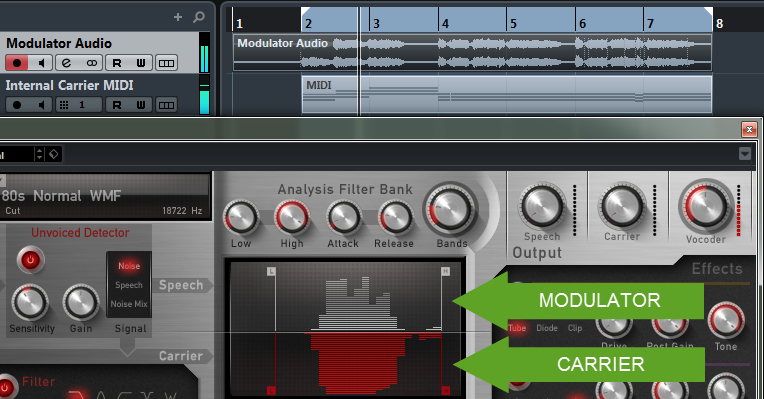 Lower the volume on your modulator track if you hear clipping or distortion. If you don't hear anything, make sure the EXT SYNTH fader next to the Master Volume knob is all the way up and double-check your routing of your carrier audio source (step 5). If you were successful in following the above use cases, you should now be able to jump in and explore V+'s many features.